The gift could be anything from a gift certificate for their favorite restaurant or a bunch of passes to the local movie theater. SDESIGNUIT created a Tetris-esque piece of furniture that can serve as a bed, sofa, or two chairs and a table. Try to choose decorations that do not have to be stored away for eleven months of the year. When you are trying to keep clutter out of your gift recipients’ homes, consider online gift options. 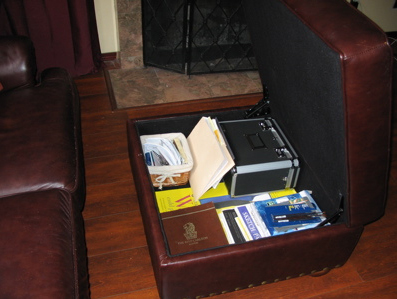 Tips for being prepared for unexpected and expected house guests. This week’s Workspace of the Week is UberTechnica’s clean desk workspace. Twitter developer Alex Payne shares insights into how to use Twitter to help unclutter your life, and specifically your communications. I think that this is one of those instances when the pictures say more than any words I could provide. Thank you, Bullismaureen, for such an outrageously cool submission to our flickr pool. The Unclutterer staff would like to wish everyone a happy Thanksgiving! On our lists of what we’re thankful for again this year is you, our Unclutterer readers. We’ll have a light posting schedule over the course of the next few days (just one post a day), but we will be back in full force on Monday. Happy Thanksgiving! Who among us hasn’t accidentally dried a wool sweater in a dryer only to be left with a tiny version that is useless? What does one do with a garment that can’t be placed in the dryer? Usually the article of clothing ends up laying on a flat surface and dries in a day or so. Now, you can speed up the dry time by up to 75 percent with the Sweater Dryer with Fan. The innovative fan requires 6 C batteries, but the time you save on drying is well worth it. The Sweater Dryer may look a bit silly and really large and cumbersome, but with a 75 percent decrease in dry time can you pass up such a time-saving device? How else does one increase the efficiency of drying a sweater? Thanks to reader Andrew for bringing this unitasker to our attention. Consider giving the Fujitsu ScanSnap this year as the ultimate organization gift. Gifts that can and will be eventually used are terrific ideas for people who enjoy giving gifts that can be touched and opened. If your cupboards are anything like mine, you will likely come across some duplicate canned goods that you can take a local charity in time for a much needed holiday feast. I love Lifehacker because 1.) Gina, Adam, Jason, Kevin, and newbie Jackson are rock stars, and 2.) I constantly find ways to improve my life from reading the site. Recently, Gina wrote about AwayFind, and this post has revolutionized how I approach e-mail. Here’s how AwayFind works: When you set up your auto response message in your e-mail client, you write a few words about how you aren’t really checking e-mail. Then, you stick in a final sentence that explains if there is an emergency that you can be contacted via AwayFind. You put a link to your AwayFind page in the text of your away message, and then people receiving the e-mail have a way of getting emergency messages to you without you having to publicize your cell phone number. If someone believes that they can’t wait until you return from your vacation to get into touch with you, they click the link and are taken to an online form where they can customize their emergency message to you. I like the program because you don’t actually have to go on vacation to use it. If you need to do some heavily focused work for a few days, set up an away message and only receive emergency messages. Once your schedule returns to normal, you can weed through all the non-emergency messages that came in for you. You stay focused, but not out-of-contact when you’re truly needed. 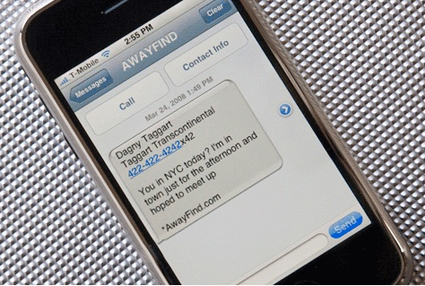 You remain in control of your e-mail with AwayFind. One of my major productivity challenges is that I have a difficult time learning lessons from my mistakes the first time they happen. I’ll get an idea in my mind for how something should work, and then when it doesn’t go as planned, I take little or no notice that my procedure was flawed. Here, let me give you an example: I’m currently working on an article for a magazine. According to my calendar, I should have been working on this article every morning this week from 8:00 until 10:00. So far this week, I have yet to work on the article between 8:00 and 10:00. This is the busiest time of my day. I have been interrupted with important endeavors every time I’ve tried to work on the article. But, did I adjust my schedule to work on the article at a different, less chaotic time? Nope. Not a bit. For FOUR DAYS this block of time hasn’t worked for me and this article, but I haven’t done a single thing about it. Instead, I’ve stayed at work an extra two hours every evening to get the work finished. This is what I should have done: On Monday evening, before I left work, I should have rearranged my schedule for the next day so that I could try working on the article from 2:00 to 4:00 in the afternoon. If things went well, then I should have rearranged my schedule for the remainder of the week. If they didn’t go well, then I should have tried a different time slot for the next day. To help overcome my inability to learn lessons the first time, I have devised a new strategy for the end of my work day. I’m going to keep up with my practice of preparing my desk and materials for tomorrow’s work day, but I’m going to add a routine before this process. What processes went well today? Why did those processes succeed? What processes didn’t go well today? Why did those processes not succeed? What changes can I make in the future to turn these non-successful processes into successful processes? How do you analyze your work to keep from making the same mistakes repeatedly? My wife and mother-in-law have a tradition of waking up at an absurdly early hour the day after Thanksgiving to brave the crowds for the best deals of the season. I’ve never taken part in this tradition, mainly because I really don’t enjoy shopping and these days I do most of my shopping online. I have become more understanding of this tradition in the last few years since about 90 percent of our holiday shopping is completed with about a month to spare. It is the Band-Aid strategy to holiday shopping, fast and a little bit painful. Always make a list of what you are planning to buy and for whom. Check out all the holiday ads for the best deals and what time these deals end. Plan your day. After looking over the advertisements, plan your shopping agenda. Remember to eat. After hitting up the early morning sales it is good time to go eat breakfast. Be sure to conceal your purchases in your car by covering them with blanket or putting them in the trunk. My wife, after meeting my dad and me for breakfast, gives us her early morning purchases to make room in the car for new purchases. Be sure to have all of your coupons organized and ready, ($10 off at Macy’s, 10 percent at JC Pennys) don’t take all those sales ads with you, but do keep them in the car. Clean out your purse and/or wallet the night before and have cash or credit cards ready. Don’t hold up the check-out line digging through your purse. Be sure your cell phone is charged. If you’re shopping with a friend and you spread out and need to locate each other, a low battery could cost you that special purchase. Don’t limit your purchases to just Christmas, if friends or family member’s birthdays are around the corner, add them to your list. 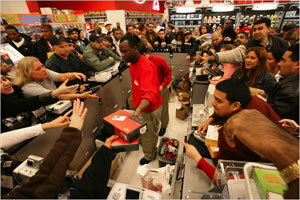 This year, due to the poor economic climate, the Black Friday deals are supposed to be especially enticing. Remember #5 from the list above when going about your shopping and try not to buy for the sake of a good deal. Black Friday isn’t for everyone, especially me, but it is an efficient way to get your holiday shopping finished in a timely manner. Just remember to be patient and try not to get in a scuffle. No one said shopping on Black Friday was painless or even very enjoyable, but the process will get a bulk of your shopping out of the way in a span one day. A ZDNet article that ran on November 16 asked the question “Is the Kindle electronic book reader worth its current price of $359.00?” The article explores the answer to this question for college students and average readers. However, a more realistic scenario [of student textbook purchasing] would be a blended cost, with half new and half used [textbooks], at $366.00 per semester. If they had purchased all of the books on the Kindle, they would have spent $234.00, or a savings of $132.00 per semester. Over a period of 8 semesters, that’s $1056.00, which if you subtract the cost of the Kindle at current prices, we’re talking about a net savings of $700.86 over four years, which is not insignificant. To put this another way, if college students had the ability to buy all their textbooks on Kindles, they could wipe out the cost of a Kindle with their savings over printed books in 3 semesters, or a year and a half. … we took a look at twelve New York Times best sellers, and totaled up the prices, assuming mostly hardcover with some paperbacks — this came to $168.15 if we bought them on Amazon. The Kindle cost would have been $109.11. In other words, if you read one book per month, and you subtract the cost of the Kindle, your net savings per year is approximately $59.04. To wipe out the cost of the Kindle completely, you have to buy and read six books per month to wipe out the Kindle’s cost over the course of one year. That’s a pretty voracious reading schedule — and if you’re reading that many books, you’re probably spending most of your time in a library and not purchasing them on Amazon. So it would seem that unless the convenience factor of the Kindle currently outweighs its costs, the Kindle is not a huge value proposition for your average consumer today. But if its cost were to drop approximately in half – say, between the 3 and 4 book per month level — at around $200 per unit – then we might start seeing greater e-book adoption by a larger segment of the population. At the two books per month level, it’s going to need to cost around $125.00 or $150.00 or so. I agree that it would be nice if a Kindle reading device would be at least half its current price, but I still think that it is a good investment over the long term. Additionally, you don’t have to pay to store paper books, which shaves off a little bit more from the equation. What do our readers who own Kindles think of the article? Is the author right about it being about convenience and not cost? Let us know your opinion in the comments. 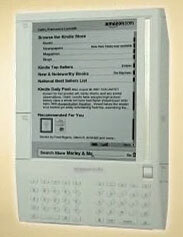 Kindle: Is it worth it? What do you give the person who has everything? You don’t. Step-by-step instructions for how to hide your desk’s power strip. The holiday season is upon us and now is the time when grandparents overindulge and spoil their grandkids by purchasing everything that they think looks cute. If you have a sweet tooth and you like to indulge in compulsive purchases, then the Caramel Apple Dipper is probably right up your alley. Natasha’s office is a studying retreat. I’m always on the lookout for project management tools that are simple to use and worth their price. I’ve written about a few of my favorites that can be found online, and personally continue to use Basecamp for work projects and LifeTick for non-work goals. Last Thursday, SmashingMagazine.com completed an in-depth review of 15 project management applications — many of which I didn’t know existed before I read the article. The applications are excellent for people working in technical and creative jobs, and can certainly help you to increase your productivity and organization at work. The article explores basic project management, wiki-based project management, bug and ticket tracking, collaboration and conferencing, invoicing, and time management applications. If you’re in the market for a new project management system, I recommend reading the SmashingMagazine review. Do you have a favorite project management application not mentioned in this set of reviews or in our previous article? If so, please let us know about them in the comments. 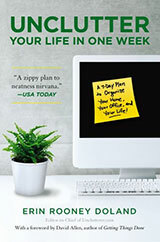 I’m interested in learning about the tools that help you to be an more organized worker. Clean off your dining table today! I don’t mean the night before, do it today (or at least start). Start finding a permanent home for each item that has accumulated on your dining room table. Chances are the same items end up there again and again because they don’t have a permanent home within your home. Involve the whole family as most of the time, clutter on the dining table belongs to more than just one person. Once you have the table cleaned off, put a centerpiece on it, or something out of the ordinary to make sure it does not accumulate stuff before your dinner party. Get the dishes ready. If you need to borrow or use special serving dishes or holiday dishes, start taking them out now or borrowing them and get them washed. Use the dining room table as a staging ground to keep them until the holiday. Clean the house room by room. Pick a room each day or a few rooms each week. Or schedule a special session with your normal cleaning service. Don’t wait until the night before everyone arrives to start cleaning. Take inventory of your guest spaces. 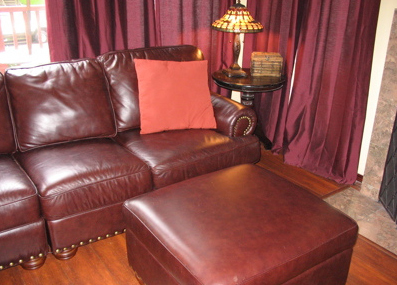 Can your guests sleep on your pull out couch or in your spare room comfortably? Does the room need to be cleaned? This is a great time to get your guest items organized, and to throw out and donate any unnecessary items that have found their way into your guest spaces. Create a friendly environment for your guests. Lay out guest towels, bathrobes, magazines, mints, maps (for your out of town guests), and water for your guests. Provide your guests with enough information so that they can enjoy your geographic area without assistance from you. Make sure they are familiar with phone and Internet access at your home as well. Be prepared to spend time with your relatives. Do your cleaning and preparation ahead of time so you can spend time relaxing and visiting, and not in the kitchen. If your relatives will be around for a number of days, consider making dinner reservations at a local restaurant so you can take a night and all relax together. Ask your guests if they have any special dietary needs before they arrive. This will help you avid any last minute trips to the grocery store. Have any gifts wrapped and ready to distribute before your guests arrive. They are lots of fun to shake and look at for the kids in your family. This will also allow you to spend time with your family instead of locked up in your bedroom wrapping presents. Remember to enjoy your company. Sharing your home can be stressful, but by cleaning and organizing in advance, you can have a relaxing time visiting with those you love! Bonnie Joy Dewkett is the owner and operator of The Joyful Organizer. 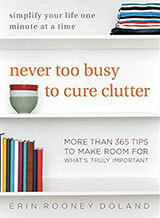 She offers professional organization services to help you organize your home and your life.